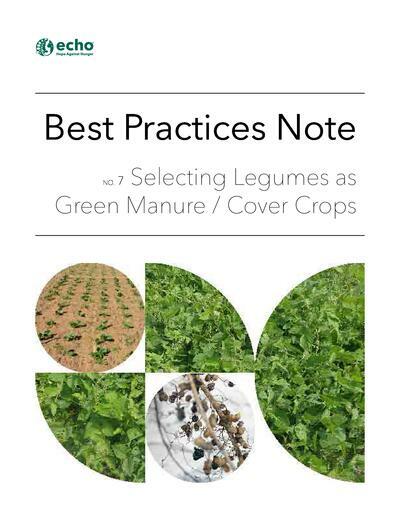 Our Best Practices Notes (BPNs) are concise summaries of interventions or approaches that have consistently proven to be effective in improving the lives of small-scale farmers in parts of the world where resources are limited. The practices discussed in each BPN are those that ECHO staff are most familiar with, based on first-hand experience or on reports from ECHO's network of development practitioners. 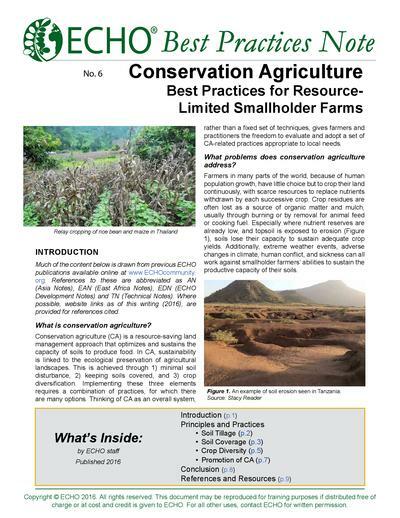 Usually the practices mentioned in a BPN have been featured in previously-written Technical Notes or in our quarterly agricultural bulletin, ECHO Development Notes. References to these and any other sources of information are noted. Each BPN, therefore, is an excellent gateway to a wealth of ECHO materials on significant farmer concerns. Every BPN begins with a description of the issue or topic being addressed. Next, recognizing that there is rarely a solution that applies to every circumstance, important principles are presented that can help guide decision-making in selecting and implementing the best practices that follow. At the end of each BPN, there is a list of resources for further reading, with links to supporting publications or presentations. Below are the BPNs developed to date. We are eager to hear your thoughts on agricultural practices that you find to be most effective, as well as any suggested topics for future BPNs. If you have suggestions or feedback on Best Practice Notes please contact us. By integrating legumes into cropping systems, small-scale farmers in low-resource settings can invest in the long-term health and resilience of their soils. Success or failure depends largely on choosing the right legume(s). With that in mind, this document presents insights on legume selection that ECHO has learned from comparing legumes across parts of Southeast Asia and through five seasons of legume screening and intercropping trials in South Africa. Green manure/cover crops are plants used to cover and improve the soil, as well as to positively impact the ecology of the land and other crop plants. Many plants can be used as GMCCs, but this document focuses on legumes—plants belonging to the Fabaceae family. They are known for their ability, in conjunction with soil bacteria, to convert nitrogen from the atmosphere into ‘fixed’ nitrogen that plants can take up. This process is called biological nitrogen fixation. Farmers in many parts of the world, because of human population growth, have little choice but to crop their land continuously, with scarce resources to replace nutrients withdrawn by each successive crop. Crop residues are often lost as a source of organic matter and mulch, usually through burning or by removal for animal feed or cooking fuel. Especially where nutrient reserves are already low, and topsoil is exposed to erosion, soils lose their capacity to sustain adequate crop yields. Additionally, extreme weather events, adverse changes in climate, human conflict, and sickness can all work against smallholder farmers’ abilities to sustain the productive capacity of their soils. 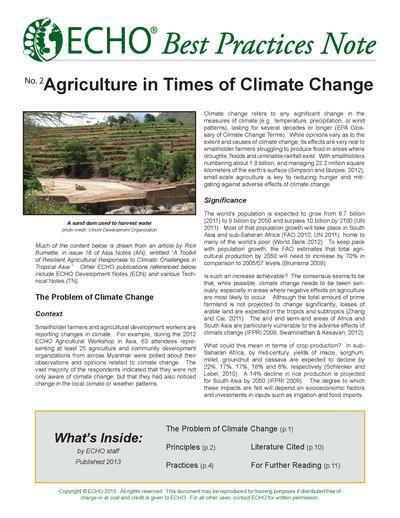 Conservation Agriculture attempts to address these problems. Conservation agriculture (CA) is a resource-saving land management approach that optimizes and sustains the capacity of soils to produce food. In CA, sustainability is linked to the ecological preservation of agricultural landscapes. This is achieved through 1) minimal soil disturbance, 2) keeping soils covered, and 3) crop diversification. Implementing these three elements requires a combination of practices, for which there are many options. 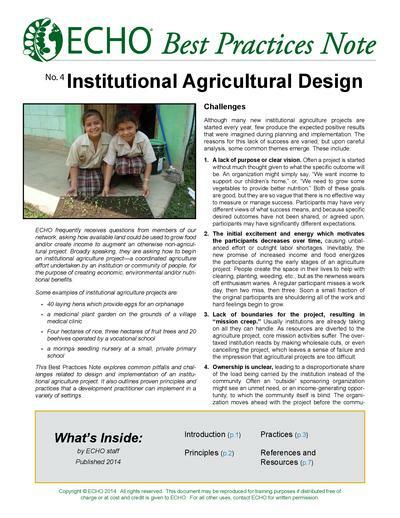 Thinking of CA as an overall system, rather than a fixed set of techniques, gives farmers and practitioners the freedom to evaluate and adopt a set of CA-related practices appropriate to local needs. Seeds deteriorate quickly under high heat and humidity. Seasonal variations exist within both dryland and humid tropical regions; however, the humid tropics are especially likely to have extremes in both heat and humidity. At the same time, resources to create ideal storage conditions are limited in many parts of the tropics. Electricity for seed drying, air cooling and de-humidifying storage rooms may be non-existent or erratic. 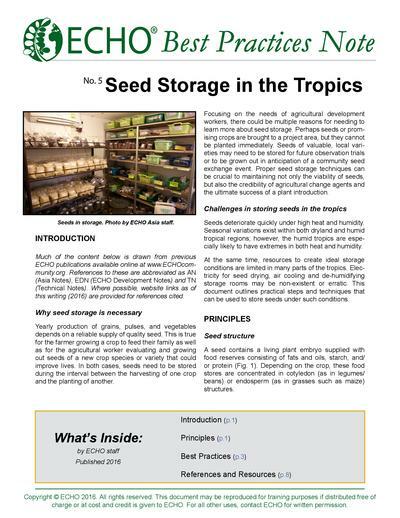 This document outlines practical steps and techniques that can be used to store seeds under such conditions. Pastoralism is a livelihood whereby people depend upon herding domesticated livestock. In East Africa, pastoralists depend primarily upon cattle, sheep, donkeys, goats and camels— listed in order of least resilience as one moves into drier and more arid lowland areas. Pastoralists play an important, though often underappreciated, role in safeguarding animal genetic resources and indigenous breeds. In caring for their animals, pastoralists have a unique ability to utilize vast remote, droughtprone areas by regularly moving their herds to the best grazing areas. In fact, East Africa’s most celebrated large conservation areas exist today partly because of pastoralists’ capacity to traverse and defend grazing areas, which helped create buffer areas of reduced encroachment by agriculturalists. To better understand the migratory aspect of the pastoralist’s life, it is helpful to be aware of the terms “nomadism” and “transhumance” used to describe the primary forms of pastoralism. Nomads do not create permanent settlements but move to or carry temporary structures with them; their migratory pattern can change from year to year. East African pastoralists are “semi-nomadic,” having a permanent home base where some of the family stays while others are out with the herds. The diet of nomadic pastoralists is based largely on livestock and food gathered from the wild. During the dry season and droughts, animals are sold to buy staple food. The UNCCD estimates that over 250 million people are affected by land degradation, and about 1 billion people in over 100 countries are at risk. According to the WMO, 33% of the world’s land surface is vulnerable to land degradation. Degraded lands lead to overall reduced productivity and reduced crop yields which directly impact population health. Degraded lands are typically a more significant problem in areas with fragile ecosystems (deserts, semi-arid, volcanic islands, rainforests, etc) and in places with heavy population loads where people are forced to over-use the same land with no alternatives. Degraded lands are also associated with areas where the land is the main resource for everything: human food, animal food, building materials, fuel, income generation, etc. These pressures create constant “withdrawals” that, if not reversed, lead to exhaustion of the land resource. 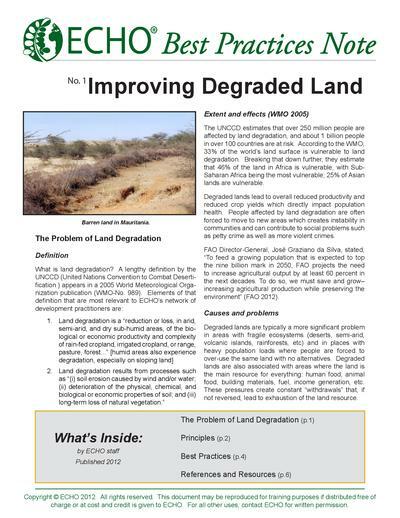 This ECHO Best Practice Note details the problem of land degradation, and provides priciples and best practices for improving degraded land.